MM Garage offer expertise when buying, selling and consigning the most exceptional classic, sport and performance cars in today’s market. We carry the belief that if “we look after our clients, they will look after us”. We are committed to providing our clients with a discrete, professional and transparent way of doing business and we bring to them over 3 decades of experience gained with the classic car business. Our network of long-lasting relationships with clients around the world has been forged through our successful private sales, major positions held in the auction industry and official roles and participation in numerous Concours and worldwide classic car events. For those with a predilection for both highly original and immaculately presented cars, our knowledge and passion for all things automotive presents an overture to your expectations. We take great pride in offering quality customer service as standard protocol. MM Garage bridges the gap between a vast network of car collector enthusiasts and your collector car. 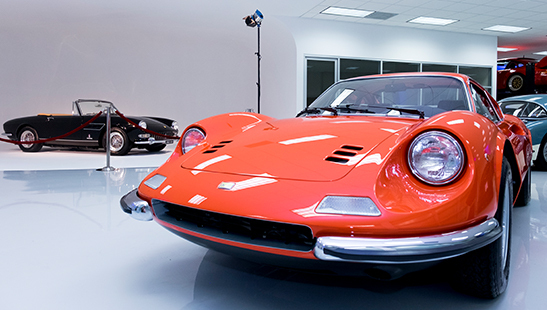 Our Newport Beach facility is fitted with two lifts for in-house pre-purchase inspections and a purpose-built photo studio cyclorama, which allows us to produce world-class presentations of our featured cars.